Is it Friday? Is it Tuesday? Is it Sunday? With the midweek holiday, the flow of the week and the feel of each day have been confusing. I worked a normal week with Wednesday off for Independence Day. On Tuesday, it felt like Saturday. On Wednesday, I was sure it was Saturday, so it was odd to go back to work with a one day break, when I had a list in my mind of what to do on Sunday. Back to work yesterday, I just didn’t know what day it was. All in all, it was fun to have the break to celebrate one of my favorite holidays! 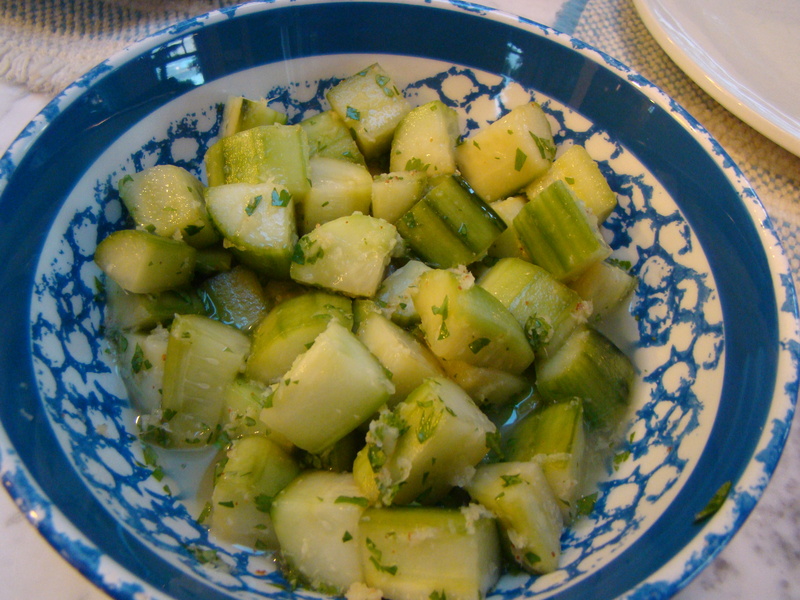 This week’s pick for French Fridays with Dorie sounded like a good picnic or cookout dish: Crunchy Ginger Pickled Cucumbers. They were super simple to put together. First, chunks of cucumber are salted and then sit for half an hour to draw out some of their moisture. Then, after draining, the cucumber marinates in a gingery vinegar bath for a few hours (mine went overnight), giving it a quick pickle. Flecks of dried red pepper (I used some Korean chile I had on hand), give them a little fire. Chopped cilantro dresses them up right before serving. These quick pickles looked promising, but I found them disappointing. Though Howard said the ginger flavor was strong, I mostly tasted the vinegar. I used rice wine vinegar and added sugar to mimic seasoned rice vinegar. I typically find this type of vinegar to have a mild flavor, but, in this dish, it tasted harsh to me. I’m not sure why. I make a ginger cole slaw where the vinegar-to-sugar ratio is 1:1. I like that combination. I’m thinking maybe I had a mental expectation that the end result would be sweeter. These pickles will get eaten, but I’m not sure I would make them again. Though, I could find a new idea about how to change it up from one of the other Doristas who also made the same recipe this week. I’ll be checking out their links here. If you want the recipe, you’ll find it in Dorie Greenspan’s book Around My French Table. Posted on 6 July 2012, in French Fridays with Dorie, Summer and tagged cucumbers, French Fridays with Dorie, pickles. Bookmark the permalink. 10 Comments. We liked them alot, but I also used a milder strength dried ginger leftover from another project…. Even if you did not really like them so much, your pickled cucumbers do look like a wonderful dish to bring along to the next picnic – well, maybe changing the vinegar might do the trick, then again, I am sure that there are other recipes for pickled cucumbers that are more to your liking – Betsy, I meant to tell you that I love it when you present your food in Bolesławiec pottery (got a small collection myself). I didn’t love these either, but they were refreshing. I agree about how confusing this week was – Wednesday totally felt like Saturday! I used a vinegar infused with walnut oil which worked out well – I was worried they would taste “vinegar-y” too! I like that your cucumbers retained some of the green color from the skin! They look good even though they weren´t a hit. White vinegar is harsh, I used rice vinegar and they were very good. Have a good weekend! I didn’t think that my rice vinegar was harsh, Betsy, but now I have to go back and think about it. I don’t even particularly like ginger but I really like this cucumbers recipe of Dorie’s. But, I’m a cuke lover. I have read many Dorista Posts this week and I haven’t found a remedy for you. Some recipes just do not work. Yours looked delicious, however, and just like ours. At least you tried it! I just couldn’t muster up any enthusiasm for this week’s recipe. But very much looking forward to next week! Betsy, Sorry this wasn’t a hit for you…I really love cucumbers and was looking forward to this dish! I think it is actually more of a salad than pickles…My Hungarian grandmother used to make a salad that reminded me of this! Yours do look good…even if you weren’t a fan! I am with you Betsy – they mostly tasted like vinegar.